Use a sponge to blend in foundation to give your face a flawless finish. Walking into a cosmetics store can feel as confusing as taking an organic chemistry final without having taken a single class. You’re surrounded by lipsticks, blushes and eye shadows -- not to mention more foundations than you realized existed. The good news is that each type of foundation has its benefits and drawbacks and once you know the differences between them, you can choose the one that’s right for you. Liquid foundations help even out your skin tone, while also filling in fine lines and pores to give your skin a smoother appearance. Renee Rouleau, a skin care expert and celebrity aesthetician, notes that liquid foundations also provide a layer of protection, which helps the skin hold onto moisture. 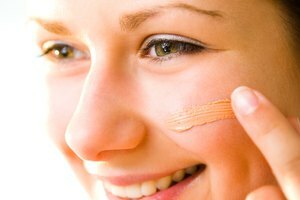 Liquid foundations, which work well for all skin types, are usually classified as medium to heavy coverage, depending on the formulation. Apply liquid foundation with a foundation brush or a sponge. If you don’t blend it well, liquid foundation can settle into the skin, exaggerating lines. Powder foundation has oil-absorbing properties, so it can wick up excess moisture and decrease shine throughout the day. It also evens out the skin tone without looking too heavy and can give the face a soft glow. 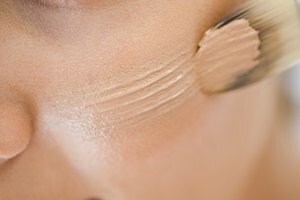 Most powder foundations, which are usually classified as light to medium coverage, work well for those who have normal, normal-to-dry or normal-to-oily skin. The downside to powder foundation is that it’s difficult to build up coverage without making the foundation look too thick. Also, if you have really oily skin, the powder can look clumpy; if you have really dry skin, powder foundation can look cakey. Apply powder foundation with a brush for sheerer coverage or a sponge for medium to full coverage. Cream foundations supply the heaviest coverage and because they are usually oil-based, cream foundations can provide moisture to dry skin. They also even out uneven skin tones and cover blemishes. Their thickness makes cream foundation more noticeable on the skin than liquid or powder foundations. They are not recommended for oily skin because the cream can exaggerate shine. Those with dry skin should also use care when using a cream foundation because it can accentuate dry spots. Apply cream foundation with a sponge and blend well. If your skin doesn’t need a lot of coverage, sheer foundations, or tinted moisturizers, may be just what you need. Sheer foundations don’t supply a lot of coverage, but they do give a little color and moisturize the skin. Sheer foundations are generally easy to match because they blend in almost invisibly, eliminating the need to find the perfect shade. 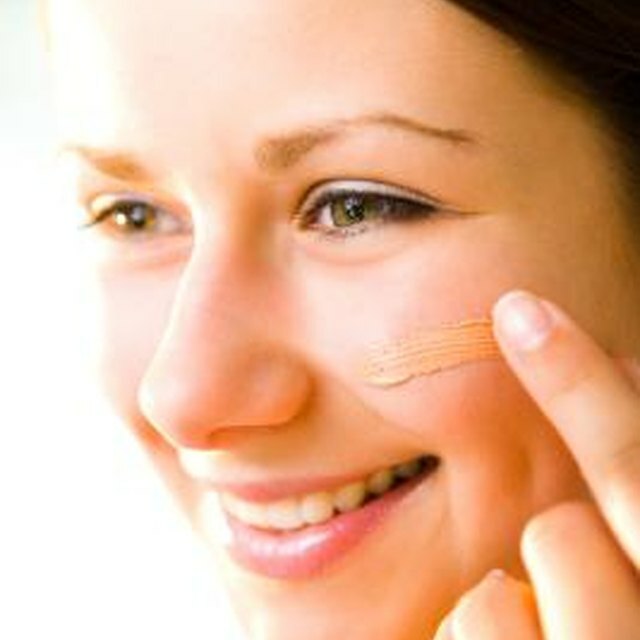 Apply sheer foundation just as you would moisturizer -- by rubbing it in evenly all over the face with your hands. ReneeRouleau.com: Powder vs. Liquid Foundation: What's Best For My Skin Type? Boyers, Lindsay. "Types of Foundation Makeup & Their Effects." 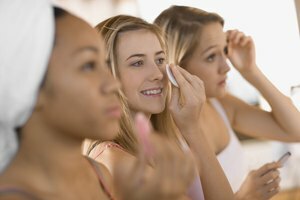 Synonym, https://classroom.synonym.com/types-foundation-makeup-effects-15655.html. Accessed 20 April 2019.